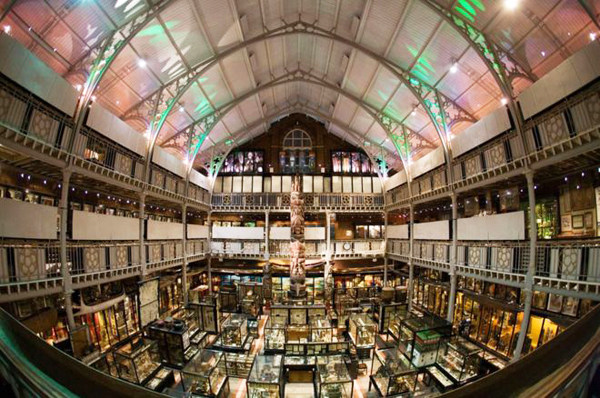 About 2,000 specimens at the Pitt Rivers Museum are of human remains. Treasures seized during Britain’s colonial past are kept in museums across the country. But as times change, how do such institutions deal with the sensitive issue of the human remains in their collections? In Oxford, the Pitt Rivers Museum – founded with the collection of a Victorian general, Augustus Pitt Rivers – holds about 2,000 such specimens. These body parts were brought back to Britain from across its empire, with little concern for the people from whom they’d been plundered. The Pitt Rivers is one of several British institutions that are under pressure to re-evaluate the many colonial prizes in their collections. “We can’t undo history but we can be a part of the process of healing,” says Laura van Broekhoven, director of the museum. She says the process is about having an “open conversation” with those affected. Since the passing of the Human Tissues Act 2004, legislation that relaxed the rules regarding the moving of body parts, the Pitt Rivers has returned 22 such objects. It’s hardly a flood of returns to the former colonies, but it’s a start. The Pitt Rivers is currently negotiating the return of aboriginal human remains to Australia, and in May 2017 Maori remains were handed over to the Museum of New Zealand Te Papa Tongarewa. In some cases these items first came to the UK because of adventurers who had connections to the University of Oxford. “We’ve a lot of family connections between the university and the people of New Zealand that date back to the first contact between the Maori and British voyagers,” Dr van Broekhoven explains. She says the Maori community showed “persistence and dedication” in getting them back. Te Herekiekie Herewini, who works at Te Papa, has been described as the country’s Indiana Jones of repatriations. His mission is to return remains to their spiritual homeland “as a means of ensuring the ancestors may be comforted and embraced by their loved ones”. The museum has claimed back about 500 skeletal remains from various institutions since 2003, and the handover last year from Oxford included seven Toi moko, which are mummified, tattooed heads of Maori origin. In May 2017 they were formally welcomed home by tribal representatives and government officials, and placed in a sacred repository, known as a Wahi Tapu. They are only open to tribal representatives with a direct genealogical connection to them. And what’s happened to some of the Pitt Rivers’ remains has been replicated elsewhere. The British Museum, which has more than 6,000 human remains in its collections, has repatriated at least 18 objects to Tasmania and New Zealand since 2004. Ashley Jackson, professor of Imperial and military history at King’s College, believes if the situation was reversed, there would be strong feelings in the UK. “If a museum in Beijing or Harare had the remains or funeral regalia of an important king or archbishop there’d be an enormous movement to try and get them back here,” he says. The current predicament is down to attitudes in the colonial period being extremely different, he says. He adds: “There must be an argument for a very human approach to understanding why certain communities, groups or national institutions want to have these back. But for Dr Tiffany Jenkins, author of Contesting Human Remains in Museum Collections: The Crisis of Cultural Authority, there now seems to be a “confusion in terms of what a museum’s purpose is”. “Once it gets involved in community work, it’s doing something slightly different, and I think in a way betraying its knowledge-seeking and educative purpose,” she says. “I’m uncomfortable when they abandon that because I think this has come out of a search for something new to do to make them relevant in the 21st Century.